My boys found ease in the comfort and courage that I found in these words. As I boy, I loved to watch Mr. Roger’s. I wanted to live in that neighborhood of his…with Mr. McFeely, Henrietta Pussycat and all his friends. But when I shared these words with my boys, I didn’t know that I would be using them again so soon on All Saints’ Sunday during Children’s Chapel. During my homily, a six year old asked if we could pray for her neighbor’s daddy who had died during Sandy—when a tree fell on him. We prayed and I invited the children to always look for the helpers and the good neighbors. 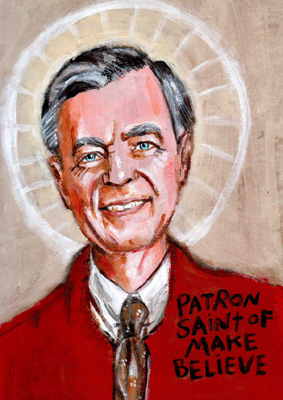 All of his life, Mr. Rogers demonstrated—both in word and action—what it meant to be a good neighbor, but he wasn’t the only one. There was another master storyteller who knew that telling stories has the ability to change their audience and through their audience the world. Jesus was often asked for his position on theological disputes or ethical instruction on how one ought to conduct one’s life, but he rarely gives an easy or definitive answer. Instead, Jesus responds to these questions with story. The best hits pop easily to mind: The Prodigal Son, Parable of the Talents, The Sheep and the Goats, the Wise and Foolish builders and the Good Samaritan…which actually ends with the exhortation: “Go and do likewise.” That exhortation is precisely the point of all parables. A story well told should impinge upon us, motivating us to go and make the story our own. I want to share a story about neighbors and that urge “to go and do likewise” that good stories foster in us. With an urge to do be a good neighbor to those Sandy-devastated communities on the South Shore of Long Island, I gathered a small group of St. John’s parishioners and followed a lead that someone had garnered from a friend who lived in Breezy Point, and was coordinating the mucking out of flooded homes. We went down for the first time just under two weeks after the storm and we discovered the Westchester chapter of Habitat for Humanity housed by Christ Community Church coordinating the rebuilding efforts. An enduring partnership was formed right there on the spot, which has seen us take over 25 day trips with over 250 people. Hearing from groups across the country has again paused me to ask that question: “Who are my neighbors?” After Sandy, I knew that my neighbors on the South Shore needed help to recover and I so organized a group of people to help. What I had neglected to remember was the presence of my “neighbors” around the country who likewise wanted to help out. Good stories always serve to create new neighbors and neighborhoods. After Katrina all of us had new neighbors in New Orleans and so is the case after Sandy. We have neighbors around the country. I do NOT share this story to tell you how great, noble or valorous the people of St. John’s Church are, but to demonstrate how sharing our stories allows us to share our lives. Sharing our stories allows us to create new partnerships and find new neighbors. I share this story, so you too might “go and do likewise” and be one of those helpers in the neighborhood. How does your congregation tell stories and reach out to its neighbors? The Reverend Luke Fodor is the Assistant Rector of St. John’s Church in Cold Spring Harbor, New York, where he works with children, youth and young families. Having spent nearly 5 years working at Episcopal Relief & Development, Luke works to empower children, families and youth for God’s mission in this hurting world.